Fixed activity lights display under macOS High Sierra. New Preferences setting: Decimal Format Precision (default is 2 decimal digits). Change behavior of OSC service discovery in order to prevent undesired OSC target changes. Improved robustness of OSC Target URL parsing. Fixed a crash happening when closing the OSC Route editor. Enabled pasting of strings containing a space character in the OSC Route editor. Improved robustness of received MIDI message matching. Restored the old behavior of creating a mapping, that is, copy of the current mapping’s messages in the new one. Fixed problems when copying messages between mappings. Made it so the table listing AppleScripts can be grown larger. Fixed a crash occurring on systems missing the font "Andale Mono". Nathan Cornes has written a tutorial on how to integrate together the Kinect, Synapse (a skeleton tracking software compatible with the Kinect) and the NETLab toolkit. 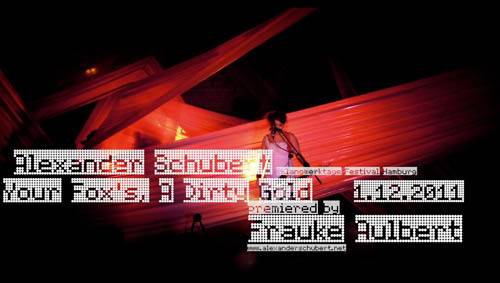 “Your Fox’s A Dirty Gold” is an interactive performance piece for a singer with motion sensors, electric guitar, live-electronics and lights. “Fox” is what you could describe as a modern pop song (a love song actually). It incorporates elements of contemporary and experimental electronic music in the domain of pop music. I like this piece, it reminds me the sounds of the No Wave style, and some early Zappa, but in a more contemporary form. This is only the trailer, but you can watch the whole piece by visiting Alexander’s website. The concept is to link all involved elements to the movement and gestures of the performer. This allows the singer to control, trigger and shape in time all technical and musical parts of the composition in real time. The software MAX/MSP is used to control the live electronics and the DMX lights. They are driven by the upper body movement of the singer and the electric guitar interface. The aim of this technical concept is to establish an embodiment of the involved electronic apexes of the piece in order to make it perceivable and controllable like a regular acoustic instrument. Freeka and I are ever busy exploring the fun world of face substitution fun. So far, we use a mix of OpenFrameworks, OpenCV, Syphon, OSC and Max/MSP/Jitter. I am amazed everything still holds together. Many thanks to Kyle MacDonald for the code that helped us getting started and Jason Mora Saragih for the Tracking algorithms. Untitled from FreeKa Tet on Vimeo. My friend Freeka Tet has been featured in Create Digital Music for his work with the great face recognition application FaceOSC his home-made face recognition algorithms. There are plenty of videos in this post, check them out! This is the first release of a series of apps that will send OSC. I think it will work great with Osculator given its speed and functionality. For what I tested works faster than Max/MSP. It’s also worth mentionning that there is a good PDF documentation and a forum making this application more than worth the 1,50 €. Find OSC Physics on the App Store. Here is an interesting review of OSCulator and Konkreet Performer on Resident Advisor. Like the author, I am not totally sure whether KP is the perfect tool for the DJs, but it is undoubtely an incredible multi-touch / futuristic / creative instrument. Luminair for iPad is an innovative, advanced DMX lighting controller over Wi-Fi. The user interface is really gorgeous but most of all, it has been thought and designed for the lighting engineer. It comprises a large range of presets for DMX lighting systems from Clay Paky to Vari-Lite. I have created a set of OSC Routing for direct use within OSCulator. If you are using a Wiimote for example you can easily select the appropriate OSC Routing to activate a cue, change the current stack or the color components of a track. You can download the files here, they also will be made available in the Samples Library in the next update.